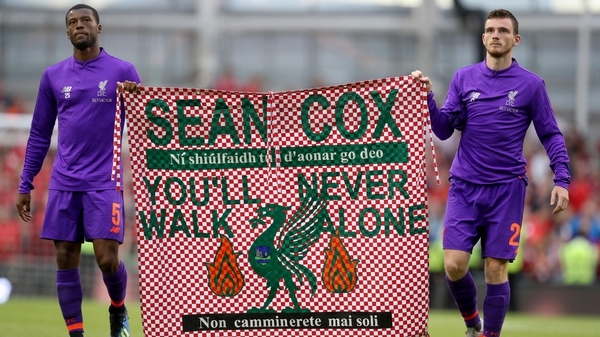 A whole host of former Republic of Ireland and Liverpool players will be on show at the Aviva Stadium on 12 April in in aid of the Sean Cox Rehabilitation Trust. A Mick McCarthy managed Ireland XI will take on a Liverpool Legends side under the watch of Kenny Dalglish in a fundraiser for the Meathman, who continues his rehabilitation from an unprovoked attack ahead of the Champions League match between Liverpool FC and AS Roma last year. Mr Cox, a 53-year-old father-of-three from Dunboyne, suffered catastrophic head injuries in the incident and has been recovering at the National Rehabilitation Hospital in Dún Laoghaire. Republic of Ireland manager McCarthy will take charge of a team that will contain the likes of former internationals Kevin Kilbane, Kenny Cunningham, Lee Carsley, Ian Harte, Stephen Hunt, and Kevin Doyle, while Robbie Fowler, Ian Rush, Jerzy Dudek, Vladimir Smicer and Djibril Cisse have all been confirmed on the legends team. Jason McAteer, Phil Babb, John Aldridge, and Ireland record goalscorer Robbie Keane will play for both teams. "I've watched Ireland play in the stadium numerous times, and was disappointed never get the chance to play here. When the opportunity came about to play in this game, I couldn't turn it down", McAteer admitted. "We will be playing to raise as much money as we can for the Sean Cox Rehabilitation Trust. I'm honoured to have been asked to play in this game." The game at Aviva Stadium will kick off at 7.45pm on 12 April and ticket prices will start at €20 for adults, Under-16s will be €10 and a family ticket (two adults and two children) will be priced at €70. Tickets for the game go on general sale via Ticketmaster on 14 February at 10am with pre-sales for FAI Season Ticket holders going on sale on 12 February at 10am.